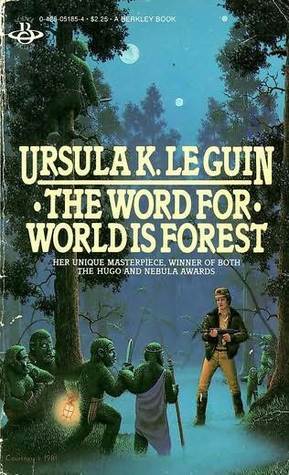 Now, Ursula K Le Guin is a brilliant SciFi writer, it's just too bad she doesn't have any real faith in humanity. On the other hand, if you lok at the world today, you can't really blame her. Of course, you also have to bear in mind that this was first published in the early 1970s. Also in the '70s, the Vietnam War was still going on and Skyjack Sunday had just happened. You can read my initial thoughts after reading the book here on GoodReads, and I still stand by that opinion, really. It really should be an obligatory read for high school kids, and I recommend it really to everyone. The story, in short, is this: Far in the future, people from Earth colonize other planets, and strip them for resources, in this case we witness the taking over of a planet the Terrans call 'New Tahiti', and the natives call Athshe. years, with the tchnology they posess), the colonists are pretty much left to their own devices, and being an almost completely male, and mostly comprised of military and frontier men, a certain social, testosterone-driven culture emerges. And 'co-exist' quickly turns into 'enslave'. "But that talk and hearsay, no matter how frightening and outrageous, could enrage a settled community of these people to the point where they acted against their customs and reason, broke entirely out of their whole style of living, this he couldn't believe." The 'he' who couldn't believe is Lyubov, a scientist, who doesn't really fit into the testosterone world, and who's pretty much the only one who tries to understand the indigenous people. I, on the other hand, completely understand that they would 'act against their customs and reason'. Because enough is enough. (And if you read the book, you'll know how brutal they were treated). One of the other main characters was Davidson, and to me, he was rather scary. He behavd appalingly, but the really scary thing was when Le Guin gav you an insight into his thought procss. He actually believed he was doing the right thing, carrying out a genocide. The really troublesome thing about him was that he had all the makings of a classic hero, only his moral compass was completely off. All in all, I'm (stil!) really glad I read this, and the story has been haunting my thoughts pretty much ever since I read it (but in a good way). I really, really recommend this one!